A couple weeks ago at a DevCamp in London, I gave a presentation on connecting mobile clients to Windows Azure Websites. Today I’d like to start covering some of the details of that talk. Briefly, I’d like to cover the approach taken prior to Windows Azure Websites. Before being able to quickly and easily deploy a new website to Windows Azure, we instead would deploy Cloud Services to Windows Azure. If you were using the Windows Azure iOS Toolkit or the Windows Azure Android Toolkit, then you were more than likely using a Cloud Ready Package as your backend. These Cloud Ready Packages were prebuilt .NET web apps made for Windows Azure. They provided access to things like the Access Control Service (ACS) and Windows Azure Storage (blobs, queues, tables). They worked, and continue to work, very well if that is all you need them for. However, if you want to grow beyond the cloud ready package defaults, you’re in a bit of a pickle. You can certainly download the source code used to compile the Cloud Ready Packages (part of the Windows Azure Toolkit for Windows Phone), however, to enhance this at all, you need to know .NET. Furthermore, you’re going to need to be running Windows and Visual Studio. As an Android or iOS developer, that might be scary. That may be downright unlikely. Fortunately with Windows Azure Websites, we can move to a paradigm that doesn’t necessitate using .NET if you don’t want to. With the release of Windows Azure Websites, it is now possible to create PHP and Node.js websites hosted by Windows Azure. Using Windows Azure Websites gives you access to many things including MySQL, MSSQL, caching, CDN, and Storage. 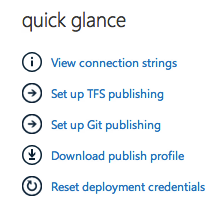 In addition, you can deploy via FTP, Git, and TFS. It really is amazing how quickly you can get up to speed with Windows Azure Websites. If you’d like to do a full walk through of setting up a new Windows Azure Website, you should check out this hands on lab on GitHub which will walk you through the basic set up and publishing of a site. 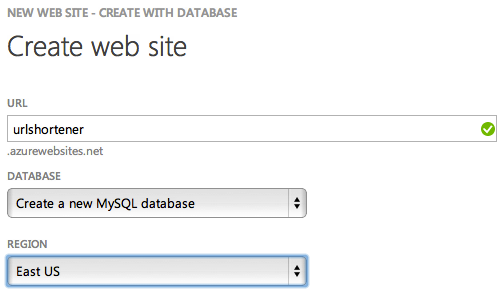 In addition, this tutorial on WindowsAzure.com will walk you through setting up a PHP site with a MySQL backend. The good news is that if you go through the second tutorial, you really won’t see a lot of new stuff in the backend I’m going to use for the URL Shortener in this article. It’s a PHP website with a MySQL backend as well. Prior to getting into the code, I would like to thank @Kehpin for the foundation of this application. It’s an adoption and slight modification to the URL Shortener he created using the Silex framework for PHP. The page will say “Creating Git repository” for a few moments and then, it will finish and show you some important info. The first thing there will be your Git URL, followed by instructions on installing Git. Lastly, you’ll see how to create a local git repo wherever your files are and then how to add your new Windows Azure Website as a remote endpoint. Note that if the directory you have your files in is already a Git repo, you can (AND SHOULD) skip the “git init” step and proceed directly to adding the remote Windows Azure Git Repo to your existing repo. Once that is done, you can pull down this PHP code. Go ahead and unzip that and, if you’re familiar with hosting a site locally, put the files in a directory you’re hosting. If you’re not familiar, that’s ok and we’re going to mostly bypass that step. One thing to note, whether you’re familiar with Apache or IIS (both web hosting servers), there is a .htaccess and a web.config file in the root folder. If you don’t know what those are, they are both configuration files. They accomplish the same task which is to tell the server that all requests should go to index.php. The .htaccess is specific to Apache, and the web.config is specific to IIS. 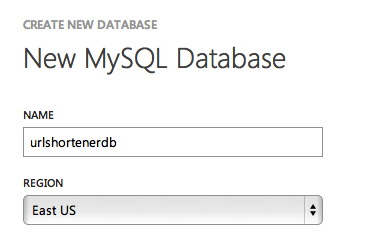 This might work if you set up MySQL locally, but not for the one hosted by Windows Azure. Go ahead and replace those values with the connection string information you got above and then save the file. Now, if you’re putting the files into a folder that is already a Git repo, skip the “git init” part and just add and commit your files to the repo. Otherwise, do the “git init” and then follow along with the add and commit. When that is done, add your remote and push. If everything goes ok, you’ll get a success message and when you view the URLs you’ll now see that MS is the shortened version of http://microsoft.com. Huzzah! You can see it running live right now here. Site no longer running. In the next article, we’ll briefly go over the code you just pushed to the server. Then, we’ll get to the fun stuff: our mobile clients! It's my 1st visit here.I am glad to read this nice article.This blog is very well written and I appreciate your efforts.. Keep up the good work. It's so much important for me. I love this things.